In his office, Pitt head volleyball coach Dan Fisher proudly displays his bronze medal from the 2016 Pan American Cup for anyone who wishes to see it. The really special hardware, though, is tucked away inside a case right beside it: his gold medal from the 2015 Pan American Games in Toronto. Earning another medal at this year’s Pan Am Cup, an annual FIVB World Grand Prix qualifying tournament, was a special moment for Fisher. But taking home the gold at last year’s Pan Am Games –– the third-largest international multi-sport event in the world –– was an entirely different experience. Fisher had been involved with the U.S. National Team several times before, but had never served as head coach. That is, until legendary volleyball player Karch Kiraly –– now head coach of the U.S. Women’s National Team at the 2016 Summer Olympics –– called him up after his second season at Pitt. Fisher was almost as nervous as he was honored. Only four years earlier, he was still looking for his first college head-coaching gig. Now, he was tasked with guiding the U.S. Women’s National Team at the Pan Am Games, where Team USA hadn’t won gold in women’s volleyball since 1967. For almost half of the 36 sports competing, the Pan Am Games serve as a direct qualifier to the Olympics. For women’s volleyball, it’s just a tune-up event. But Fisher said the experience gained from the competition is vital. It’s something Fisher never even dreamed he’d be part of, let alone win. Growing up in Goleta, California –– a small town of about 60,000 people on the central coast of California in Santa Barbara County –– volleyball seemed like the real national pastime. Fisher’s high school team practiced year-round, and when he made the varsity team going into his sophomore season, all he did that summer was play beach volleyball. “I also hit a huge growth spurt, so all of a sudden I was 6-[foot]-5 … and really getting better and liking it,” Fisher said. But Fisher credits his older brother, Brian, with teaching him the fundamentals of the game and helping him develop his skills before he grew. Now a VP of sales and marketing for The Walking Company, Brian was in eighth grade when he started playing volleyball. A fifth grader at the time, Fisher took up the sport right after his brother. Brian still remembers taking his little brother out back to learn the game for the first time. Before long, Fisher had soared past his 6-foot-3 brother in both height and physical ability. After high school, Fisher attended the University of Hawaii, where he played volleyball for two years. He transferred to California State University, Northridge, but the school cut its volleyball program after his first year, so he finished up his college career at the University of the Pacific. After graduating from Pacific in 1999, Fisher spent the next five years playing volleyball professionally in Europe. He spent his summers competing on the AVP Professional Beach Volleyball Tour –– except in 2000 and 2001, when he was busy representing Team USA at international tournaments in Japan and France. 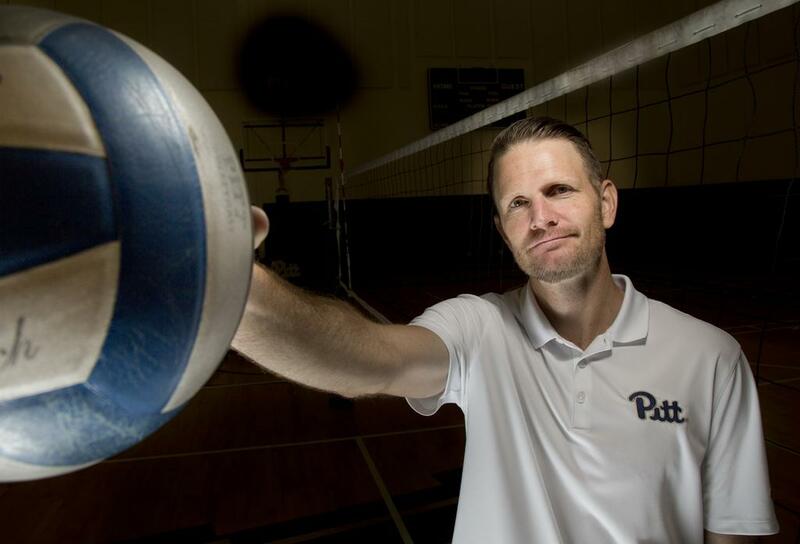 After five seasons as a professional volleyball player, Fisher decided to make the transition to coaching. While earning his bachelor’s degree in sociology, Fisher always thought he would end up being a teacher or a counselor. “I guess that’s probably what I’d say you are as a coach,” Fisher said. But sometime around his third year overseas, where he would sometimes coach youth teams in his spare time, he started thinking about becoming a full-time coach. “I remember starting to talk more seriously about it with my former coach from Pacific [Joe Wortmann], just asking more specific questions about the lifestyle, how to get involved,” Fisher said. There was only one full-time assistant coaching position at Pacific, and the timing turned out to be perfect for Fisher. Wortmann called Fisher, told him his assistant was leaving, and offered him the job at his alma mater, which he accepted. Fisher spent the next three years as an assistant coach with the men’s team at Pacific, where he simultaneously earned his Master’s degree in sports science. Fisher moved on to the University of San Francisco in 2007, where he spent two years as an assistant for the women’s team. In 2009, he switched back to the men’s game as an assistant head coach at Hawaii. But Fisher had a plan. Having spent the first two years of his college career playing at Hawaii, he knew the Warriors’ volleyball program was different than most. After football, volleyball might be the most popular sport on campus. Fisher thought getting a sense of the boosters, donors, media and marketing involved with running such a big-time program would benefit him in the long run, and it did. With Fisher as an assistant, the Warriors climbed as high as No. 4 in the national rankings in 2010 –– but he still wanted more. After the 2010-11 season, Fisher secured an interview for the head coaching gig at Concordia, an NAIA program in Southern California. As soon as he sat down, they asked him if he knew anything about the NAIA. His response? He later found out that very answer was what got him the job. In his first year as a head coach, he guided the Eagles to a 37-2 overall record and a national runner-up finish. His first season performance captured the attention of the volleyball community. The following summer, Hugh McCutcheon invited him to serve as an assistant with Team USA at the 2012 Pan Am Cup. One of the other assistants at the Pan Am Cup was a “team leader” by the name of Mike Hebert. A former teacher at Chatham University, Hebert was head coach at Pitt in the ’70s and ’80s before spending two decades coaching in the Big Ten at Illinois and Minnesota. Hebert pulled Fisher aside after the two helped guide Team USA to gold at the Pan Am Cup. “You know, you have a bright future, and if you ever decide to leave the NAIA … I’d love to help you and put a good word in for you,” Hebert told him. Back at Concordia, Fisher once again led the Eagles to the national championship game. This time, they emerged with a 3-1 victory over Columbia to cap an undefeated season. After that, Division I interest quickly started to build in Fisher. One of the schools that came calling was Pitt, and Hebert was the Panthers’ consultant charged with putting together a candidate pool. Sure enough, the two reunited. In Fisher’s first year at Pitt, the Panthers jumped to No. 82 in the RPI rankings –– an improvement of more than 50 spots. After his second year, in which they moved all the way up to No. 49, Kiraly made him the head coach of Team USA for the Pan Am Games. The Americans fell in five sets to Brazil in pool play, but received a second chance at the Brazilians in the finals. Team USA made the most of it, winning the first two sets before mounting a huge comeback in the third to clinch the gold medal in straight sets. Looking back on his championship runs with Concordia and Team USA, Fisher is blown away by how his players came together as a team to achieve their goals. That’s the only difference he recognized during his time coaching both men’s and women’s volleyball. “Probably the biggest single difference is just how strong, with women, the power of the group is,” Fisher said. Redshirt sophomore libero Angela Seman wasn’t even considering playing at Pitt before Fisher arrived. But when Fisher took over the program in January 2013 during Seman’s junior year at Seneca Valley High School, her mind was all but made up. To establish that relationship and get to know his players on a personal level, Fisher takes time out from coaching to sit down with them for one-on-one meetings, which he did after returning from this year’s Pan Am Cup. Senior middle blocker Jenna Potts transferred to Pitt after receiving a medical redshirt her first year at Xavier in 2012. As part of his first recruiting class, she has witnessed the program’s transformation under Fisher from the very beginning. Now one of two senior leaders on the team, Potts became a 2016 preseason All-ACC selection after competing with the U.S. Women’s Collegiate National Team this past summer. She is quick to credit Fisher for instilling her with the confidence to succeed with the National Team. Fisher only has about two weeks to prepare the Panthers for the start of the season Aug. 26, which is about the same amount of time he had to prepare the National Team for the Pan Am Cup. This season, the Panthers’ goal is clear: to make the NCAA tournament, which they just barely missed out on the past two seasons. Fisher thinks that goal is well within reach this year. For the future, he has even bigger and better plans.